a Christian ethic that Christians subscribe to in their personal lives that non-Christians don’t. a Christian practice that, as members of a church, Christians observe that is ignored by the non-Christian. a Christian spirituality such as prayer and meditation that a Christian might practice that is unexplored by the non-Christian. However, when it comes to all of life, there is not any Chrisitan thinking commonly taking place. In Blamires’ mind, most Christians accept the morality, worship and spiritual culture of religion but reject the “religious” view of life. Christians have succumbed to the secularization of the mind. This is evidenced by thinking that ignores the supernatural as having any part to play in everyday life. There are those who will share their grave concerns as to the direction society is going. In many cases, these concerns are in line with the concerns we, as Christians, have as well. However, they can only address these issues from a humanistic view and, therefore, cannot begin to address the cause and/or the cure for the direction we are all heading in. The alarming thing about what Blamires so accurately described is that he wrote this book in 1963. 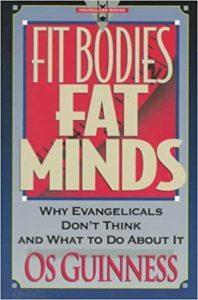 Failing to think Christianly, evangelicals have been forced into the role of cultural imitators and adapters rather than originators. In biblical terms, it is to be worldly and conformist, not decisively Christian. We are a people with a true, sometimes a deep, experience of God. But we are no longer people of truth. Blamires and Guinness talk a great deal about “Christian” things. I struggle with using Christian as an adjective to describe anything related to life today because the term has become so subjective. What does Christian mean? 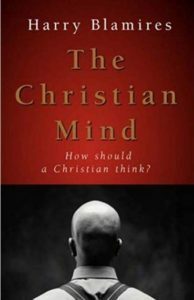 What does it mean to have a Christian mind? What does Guinness mean when he says we need to think Christianly? I am thankful that Guinness goes on to define what thinking Christianly really means. Most parents do not have a biblical worldview and are not seeking to develop one in their children. The media to which our children are exposed do not reflect biblical principles and are not seeking to develop a biblical worldview among our children. A huge majority of Protestant churches do not have ministries that are focused upon helping to establish a biblical worldview in the minds and hearts of children. Government laws are not geared to facilitating a biblical worldview among children. Barna then left the attendees with this challenge. So…who is called to, and capable of, leading movement to lead the development of a biblical worldview in the minds and hearts of America’s children? We have to insist on presenting Christianity as a comprehensive, unified worldview that addresses all of life and reality. It is not just religious truth but total truth! Once we do this, we must then be committed to following God’s plan for educating future generations. Amen! As an educator I see the cultural shift in Christian homes and millennial parents to incorporate so much of the secular into their daily life. Perhaps it’s done without even recognizing it. The challenge for teachers is to help parents and students understand that those biblical principles we know as true must apply to every detail of our life however minute! Our time is sacred, our words are sacred, our fun is sacred, life is sacred…everything is sacred! Barna’s alarming surveys comparing attitudes and actions of North American evangelicals with the rest of the population give incontrovertible evidence that Harry Blamire was right. A Christian mind in our culture is conspicuous by its absense. For example, when realities like the fact that evangelical Christian divorce rates are the same or worse than those in the society around us, it’s clear that something is deeply wrong. Something essential is missing. Jesus taught “As man thinks in his heart, so is he.” Or borrowing an image from a children’s fairy tale, if a frog is transformed into a handsome prince, but spends his days sitting on a lily pad eating flies, his unchanged way of thinking will keep him a prisoner of the swamp. Thanks for sharing this and the resources. I have a passion for helping Christians grow in their understanding of God’s ways and Biblical worldview. We have to think like God thinks.